Tonight was almost another Feed Fail. I was on my way to Jasmin Indian, but on the way there, I saw a huge ad on the back of a bus. It was an elegant black and white logo, proclaiming The opening of Dine Central, in Adelaide Central Plaza, under David Jones, in Rundle Mall. I decided to check it out, but discovered a rather more disappointing reality. "Dine Central" was not open for dinner, and was simply the David Jones food court, with some fancy chairs. The cleaner confirmed for me that I'd come to the right place. I then headed to the Indian restaurant. It was empty. I was quickly brought a menu, whereupon I discovered I was the only customer at the Thai restaurant next door. I apologised, and headed next door to the Indian restaurant, which was completely booked out. I felt sorry for the Thai guy. 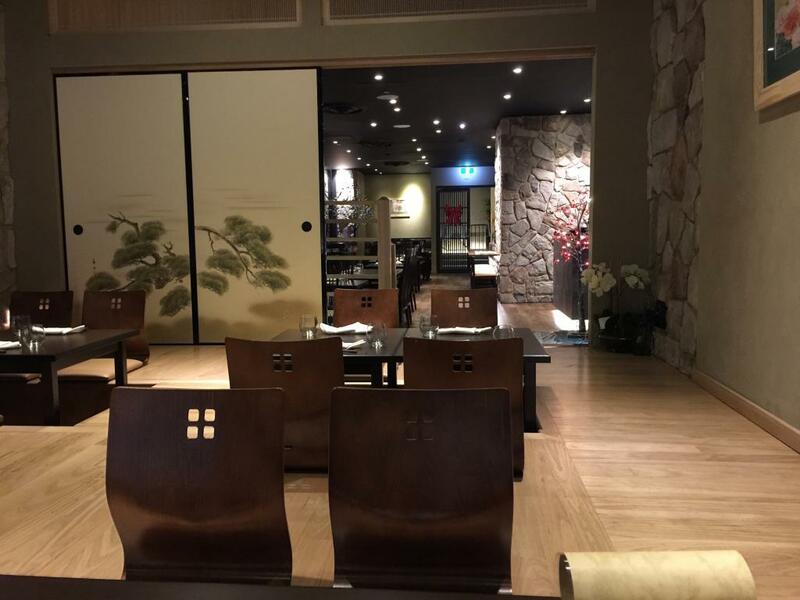 So here I am, at Ginza Miyako, which I gave a score of 4 and 4 on my last visit. 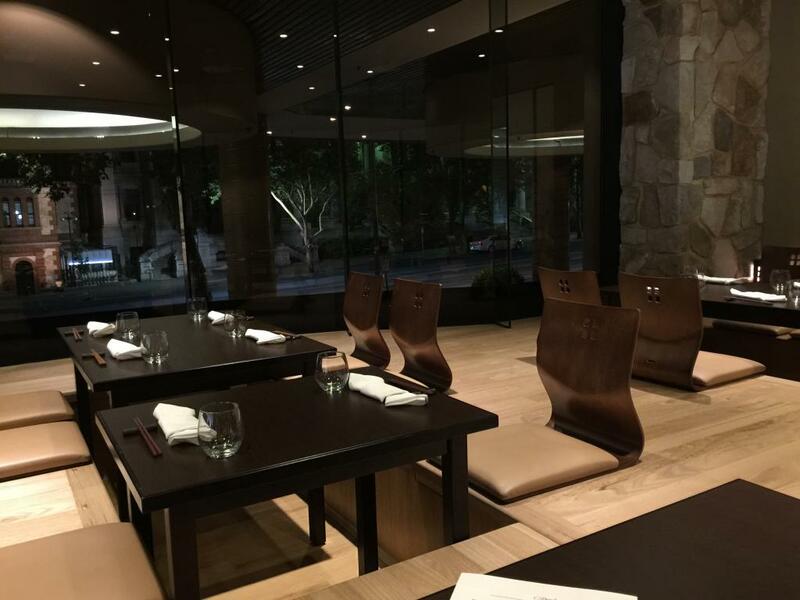 They were a "French-Japanese fusion" restaurant, but that seems to no longer be the case. I'm sitting in the hole-in-the-ground section of the restaurant, with my knees below floor level. "How do I get in?" I ask. The much more lithe Japanese waitress kneels and does a kind of a roll into the recess. I just push the table away, and clamber in. The waitress then goes through every menu item. This is excessive, but, being fussy, I don't mind at all. 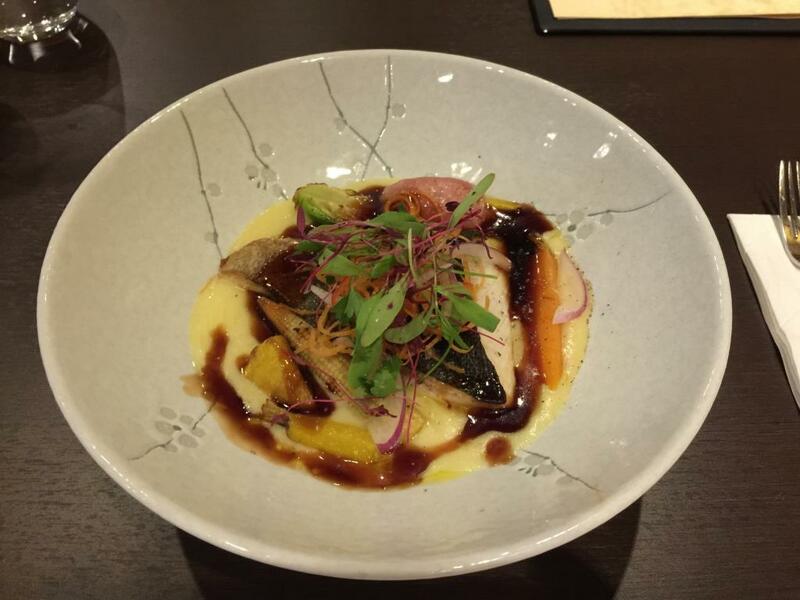 Served with grated apple, radish and teriyaki sauce. This dish is almost like a tuna mornay. The miso sauce has a very cheesy quality about it. The teriyaki sauce adds a bit of soyey tang. The combination of tuna mornay and salad bits is a bit strange. It doesn't taste bad, but the texture combination is odd. There are Also seven large bones in this dish, and a patch of two or three large scales. Unless you're the local fish and chip shop, that's not really good enough. 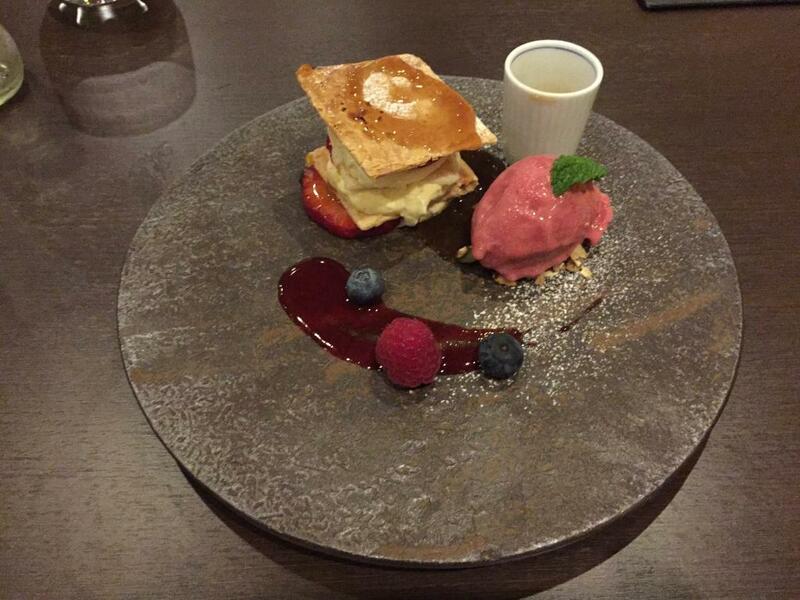 Mille-feuille served with rhubarb ice cream and Japanese plum wine sauce. The very savoury pastry here is difficult to eat. I have to smash the dessert in order to cut it up. It's difficult to pick up, and even difficult to eat, as it breaks up into strong, thin sheets. Inside is just sweet cream. That, plus strawberries, is a pretty basic and uninteresting dessert. However, the bits that got Japanese plum wine sauce have an extra tang that makes all the difference. The rhubarb ice cream with pistachios is more of a gelati or sorbet. It's only slightly creamy and sweet, but the string rhubarb taste is enough to make it interesting. The manager visits my table, and briefly talks about the restaurant. The chef changed a few months ago, and there's a new (and improved) menu. Is a restaurant with a new chef still the same restaurant? I'm not so sure. Free 'zert! Reason: excessive fish bones.